The HoM awards went to Norman Bush and Lee Morley. Congratulations to them. They will receive technical running gear from HoM sponsor UP & RUNNING. The ladies won the team prize. Norman Bush was 80th in 45:09, 2nd V60 by just 2s! I would recommend it for anyone interested next year and the juniors can race at the same time and do the first lap only. 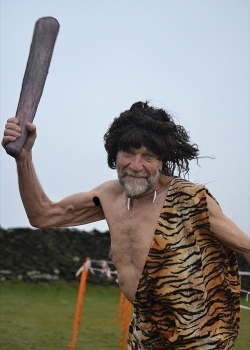 Lee Morley reports ... a trip back to family on Boxing Day meant a chance to have another go at the Whinberry Naze Dash in Rossendale a 4m 750ft fell race. I managed first place, beating Christmas Puddings, Turkeys, and a Sumo Santa amongst many others in fancy dress, good photos on FRA website. The Christmas Relay is a super Harriers tradition, revived by Bernie Gibbons, friends, and family, a few years ago, and is a wonderful way to round off the year. This time we had the most entries since 2007, we think, and possibly the best fancy dress ever! Prizes went to the Teletubbies and the Skiers, and first team home was the Stevens family we think. It was lovely to see so many family teams running, and back at the Quiz after. Vince's Christmas Quiz, now in its 2nd year, packed the ILT&SC bar. A special thank-you to the ILT&SC catering staff who magically transformed 'food for 50' to enough to feed 70 hungry runners at very short notice. 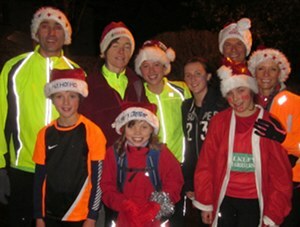 Bernie Gibbons reports ... A total of 72 runners took part in the relays, fuelled by mulled wine and mince pies. The event raised �140 for Cancer Research UK. Many thanks to Pauline Watts, Brian Sweet, Mandy Chapman, Ros Blackburn, Amanda Parnaby, Ann Pearson, Mary Gibbons and Paul Wood who organised it all. 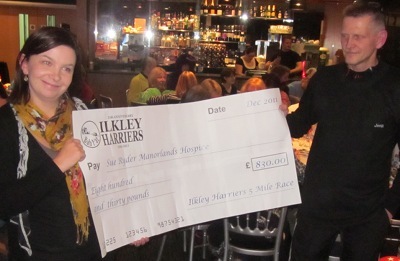 At the Christmas Quiz Ilkley Harriers was able to present a cheque for �830 to Sue Ryder Manorlands Hospice. The 5 Mile race organised by Neil Chapman on 26th November was fabulously supported by Ilkley Harriers members, and this is a remarkable result from a small race. A big thank you to everyone who contributed in any way. Photo: Rachel Cunningham accepts the big cheque for Sue Ryder from race organiser Neil Chapman. Steve Turland reports ... Was up in Northumberland for a pre-Xmas family bash, so fuelled on party food and cake, I did this 11m fell race from Rothbury. 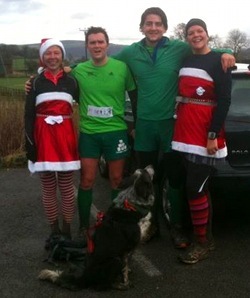 Part of the race went through a dark wood where the race organiser had constructed Christmas Lights and Music. Very festive (if not a little surreal!!). I finished 3rd overall (2nd vet) out of a field of 191, so from now on, will be changing my pre race meal from pasta to sausage rolls, crisps and chocolate cake. Jamie Hutchinson reports ... a great little race, with one 10k on the Saturday and same again on the Sunday. Starting from Sticklebarn tavern a fairly rapid run down the valley turning around a Chapel Stile before a not so rapid run back up the valley. I managed 5th overall and 2nd V40 and a time of 36.59, the race was won in just over 33 minutes. 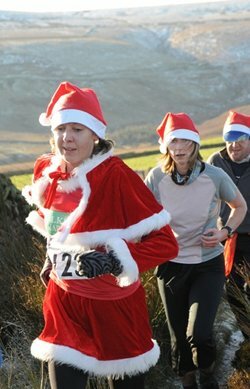 A free Xmas pud to all finishers! 8 Robert Cunningham was 8th in 19:50 at the Finsbury park (London?) event. Diane Haggar reports .... LADIES TAKE BRONZE IN COMPLETE RUNNER XC LEAGUE Another fantastic turnout of 10 ladies at Wakefield. Sally and Emma again spearheaded the team with myself and Helen T the other scorers. We improved one team place to take 3rd team on the day. The importance of completing a team at every race was underlined when Bingley failed to do so, thus elevating Ilkley to 3rd team overall for the 4 race series. Dave Westhead adds ... the men, despite the significant absence of Tom Adams, turned out a good team for a muddy slog round Thornes Park, and a creditable final team league position of 6th. There were some excellent individual league results as well. Chris Cunningham reports some warm-weather results (26 Brits amongst the 357 finishers, full results here). John Marshall was 148th in 28:06 at Leeds Hyde Park. Amanda Parnaby reports ... 24 miles in and around the Yorkshire Wolds with tremendous weather for time of year, especially compared with last year which was postponed until March. Debbie Lewis completed in 4 hrs 27 mins and I completed in 5 hrs 59 mins.